The McGills saw there first Sandhill Crane while trekking around the Upper Peninsula of Michigan. They were amazed to see this exotic looking bird in the marshes near the Upper Taqhuamenon Falls. Once almost eliminated from the State of Michigan the Sandhill Crane has made a miraculous comeback. It is tall stately bird with long neck and long legs for wading. It appears to be larger than it actually is. The male averages twelve pounds and the female around nine pounds. The Sandhill Crane stands four to five feet tall, the male being the taller. Except for size the male and female share the same coloring.The Sandhill Crane is gray in color with white face and red forehead. The pair of Sandhill Cranes shown to the right were filmed in the Upper Peninsula near Paradise. Due to it�s constant preening with mud stained with iron oxide, it appears reddish brown in the spring and in the summer until it molts in late summer as shown in the center photo. The Sandhill Crane is also quite often confused with the Great Blue Heron both having long necks, long legs and long pointed bills. The Sandhill Crane though is less aggressive and less dangerous than the Great Blue Heron. The Great Blue Heron could puncture a human skull in one blow. Also when flying the Great Blue Heron flies with it�s neck in a "S" shape while the Sandhill Crane flies with it�s neck straight out. Note the pair of Sandhill Cranes flying over the marshland in Seney National Wildlife Refuge. 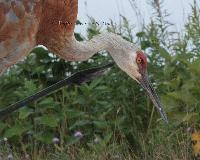 The Sandhill Crane is omnivorous eating both plants and animals. It�s main diet consists of many small aquatics such as crayfish and even mice along with nuts and roots. It rarely eats fish especially large fish as the Great Blue Heron does. The Sandhill Crane gleans the fields after harvest of left over grains. Thought to damage crops the Sandhill Crane actually is helpful to the farmers by devouring weed seeds and harmful insects. Note the band on the leg of the Sandhill Crane on the left. He is one of a pair raised by humans via the puppet method on Seney National Wildlife Refuge. The Sandhills are fondly called Frik & Frak by Teresa. She and Michael have gotten to know the pair quite well throughout their years of filming and photographing them at Seney National Wildlife Refuge in the Upper Peninsula of Michigan. The photo on the right is Frik & Frak flying over F Pool at Seney. The center photo is a pair of Sandhill Cranes that have made M-28 near Munising, Michigan in the Upper Peninsula their home. The McGill's have filmed them also in the past few years. Unfortunately they have not been able to raise a young that survived. The Sandhill Crane�s voice is what sets it apart from other species. It make a high pitched cackle croaking sound. It�s especially enchanting when done in a series of calls in unison. The female gives two notes to the male�s one. The Sandhilll Crane migrates back to Michigan in February or March depending on which region. The Sandhill Crane does not migrate in Spring in the large numbers as it does in the Fall. The Sandhill Crane mates for life and returns to the same nesting area year after year. It�s previous year�s young travel north with the parents but is given a rude awakening when the parents drive them out of their territory. The young then connect up with other young till time to find a mate of their own at about three years of age. A territory can be ten acres or two hundred acres. The Sandhill Crane generally chooses a remote wetland to nest. But due to the increase in the Sandhill Crane population it will occasionally nest in areas closer to human habitat. The nest is very large consisting of vegetation formed in a mound three to five feet off the ground near and above water if possible. Typically two eggs, double the size of a chicken egg, are incubated by both parents for 30 days. The first hatch chick will often attack and kill the second chick. It is unusually to find two surviving chicks but it is possible. The McGills have been fortunate to see this on more then one occasion. 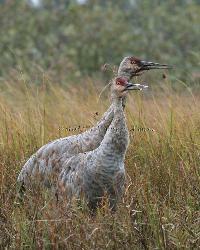 The photo on the left of the Sandhill Cranes with two young was shot near Paradise, Michigan in the Upper Peninsula. Unfortunately more often than not, the Sandhill Crane young do not survive, whether it be weather, predators, diseases or just natural causes. 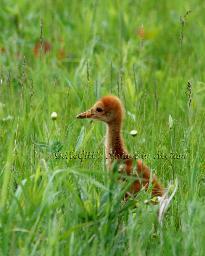 The McGills were saddened when a baby Sandhill Crane that had been filming was discovered dead. They had just been filming the family of Sandhill Cranes earlier in the day. 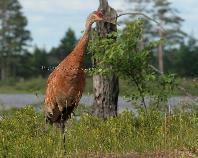 When they got to the area on H Pool in Seney NWR, they noticed that the baby was laying prone, not a normal position. The parents were acting very strange, too. They stood over the baby picking and poking around it. The daddy Sandhill finally slowly moved to another island where he chased out another pair of Sandhill Cranes. But the mother....she continued to poke around her baby. She would start to leave then come back and "cry". Teresa was so moved by her action, she was brought to tears. Finally after a half hour or so she slowly made her way to where her mate was patiently waiting for her. This is Nature taking care of Nature. The cycle of life whether human or animal. Life is precious in any form. We have to enjoy each moment we are given. Michael radioed to Carrie Creiger, the ranger at the Visitors Center. She wanted to retrieve the body for examination as to the cause of death. So she and Michael paddled through the muddy waters to assess the situation. They discovered no marks of attack on the body. Carrie secured the body to be examined at a later date. Carrie said that they would probably use the baby for educational instruction at the Visitors Center. The McGills have had the privelege of filming and photograhing a pair of Sandhill Cranes that make their home in the marshlands north of Trout Lake, Michigan in the Upper Peninsula. This is their first offspring to survive in the past five years since the McGills have known them. The parents seem to keep close to human activity if possible with their young. No doubt in an effort to keep the predators at bay. 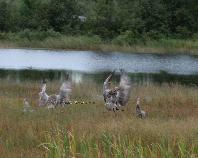 Within ten weeks of hatching the Sandhill Crane young can fly. In the Fall, after the young have hopefully grown, the Sandhill Crane starts to become social again. The Sandhill Cranes start to gather for feeding and roosting. The Sandhill Crane�s dance is one of the most amazing sights to behold. Often associated with courtship the dance can serve several purposes . It consist of a series of bows, jumping and stick tossing. It starts with one and spreads throughout the flock. And what a spectacular performance it is. A sample of the dance is shown in the photo on the right taken near Rudyard, Michigan. 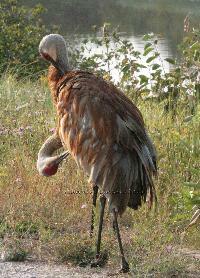 The Sandhill Cranes finally gather in large flocks at �staging� areas. Rudyard in the Upper Peninsula of Michigan has been a �staging� area for the past several years. The McGills have filmed upwards of two thousand Sandhill Cranes at one time. AMAZING!! A small sample of the gathering at Rudyward is shown in the photo on the left. The Sandhill Crane heads south in late fall to Georgia and Florida. Northwest tailwinds along with the mid morning sun warms thermals to carry the Sandhill Crane at speeds of up to 50 mph and as much as 500 miles in a given day. In peak November migration as many as 30,000 Sandhill Cranes will gather in Indiana�s Jasper-Pulaski Fish and Game Area. Over the past few decade Sandhill Cranes have increased in Michigan from 27 pairs in the 1940�s to over 800 nesting pairs in the 1980�s. Now over 8,000 Sandhill Cranes can be found throughout the State of Michigan. The call of the Sandhill Crane is a positive sign of how just how far we have come in this Great Lakes State of Michigan to help other endangered species, such as the Bald Eagle, to be able to flourish. But we must keep vigilant to maintain this healthy environment for future generations.